Written by three Australian health experts, The Weight Escape: Stop fad dieting, start losing weight and reshape your life using cutting-edge psychology, is arguably the best weight loss book you’ll read this year. There are about 50,000 diet books available online¹ but most of these focus only on what you’re eating. The Weight Escape is different. The first thing you need to know is that this is not a diet book. It is a book about overcoming the psychological barriers that are getting in the way of your attempts to lose weight. Most of us know what we have to do to lose weight – eat less and exercise more. It sounds pretty simple. That is, until you go on a diet or start exercising. It is then you realise that while you may have the desire, you lack the motivation to stick with it. Why is that? You may ask. The answer lies inside your head. Using ‘Acceptance and Commitment Therapy’ (ACT), Medical Doctor and author of ‘The Happiness Trap’ Dr Russ Harris, Clinical Psychologist Ann Bailey, and Professor of Psychology at the University of Western Sydney Joseph Ciarrochi, will help you to discover why you became overweight or obese and how you can use this information and the other psychological tools they give you, to achieve lasting weight loss. The last part of the book is a ‘Seven-Week Weight Escape Boot Camp’ which will reinforce what you’ve already learned from your reading of Parts 1 & 2. And if you think you won’t need the practice, think again because some of these concepts will be new to you. 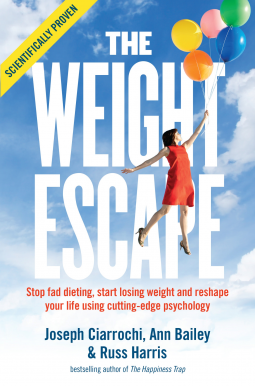 While this book does focus on weight loss, what you’ll learn from a reading of The Weight Escape could easily be applied to other areas of your life. So don’t be surprised if you are motivated to improve other areas of your life as well. But perhaps the most important lesson you’ll learn here, is how to put diet and exercise where it really belongs. For many of us, dieting and exercise have become such a major focus in our lives, that we have stopped really living our lives – we put our lives ‘on hold’ until after we reach our goal weight. In this regard, the message of this book is clear. It’s time to just get rid of it and start living the life you were meant to have. ‘The Weight Escape: Stop fad dieting, start losing weight and reshape your life using cutting-edge psychology’ Joseph Ciarrochi, Ann Baily & Russ Harris, is published by Viking/Penguin Australia and is available now in paperback (RRP AU$29.99) and ebook (RRP $16.99) formats. 1. ‘Michael Mosley is on the fast track to fitness’, The Australian, 18 January 2014: http://www.theaustralian.com.au/news/features/michael-mosley-is-on-the-fat-track-to-fitness/story-e6frg8h6-1226804169250 accessed on 22 January 2014.